This week’s theme includes items for the home, clothing, kitchen products, and health and mobility items. 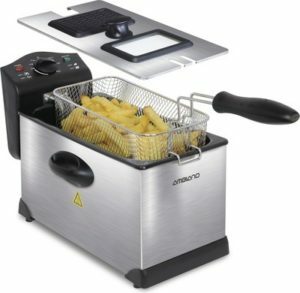 Ambiano Deep Fryer, $24.99. This features a 3-L capacity and has a 12-cup basket capacity. Read our review of Aldi’s deep fryer at this link. Easy Home Personal Ultrasonic Humidifier, $14.99. This has an 8-hour run time and 32-oz. water capacity. Huntington Home 60″ x 70″ Feather-Soft Throw, $12.99. Made of 100% Polyester. Choose Red, Gray, Navy, or Taupe. Huntington Home Signature Sculpted Blanket, $17.99. Choose Taupe, Gray, or Aqua. The Full/Queen size measures 90″ x 90″. King size measures 108″ x 90″. Huntington Home Signature 400 Thread Count Sheet Set, $39.99. Made of 100% Cotton. Choose Gray, Blue, or Taupe. Huntington Home Accent Fragrance Warmer, $4.99. Plug rotates 90° to fit outlet. Includes incandescent bulb. Wax melts not included. Huntington Home Scented Wax Melts, $1.69 for 2.5 oz. Huntington Home Metallic Candle, $7.99 for 18 oz. Huntington Home 12″ Decorative Lantern, $9.99. Huntington Home 24″ x 36″ Decorative Accent Rug, $12.99. Huntington Home Photo Collage Clock, $14.99. Measures 20″ W x 20″ H x 1.65″ D. Displays eight 3.2″ x 3″ photos and four 4.5″ x 3.5″ photos. Huntington Home Wall Shelf Set, $14.99. Measures 10″ L, 12″ L, and 18″ L with a 10-lb. capacity per shelf. Assorted colors. Huntington Home 2-Pack 18″ x 18″ Decorative Pillows, $12.99. Made of 100% Polyester Chenille. Choose Blue, Taupe, or Gray. Huntington Home Faux Succulent or Plant Assortment, $9.99. Succulent measures 7.5″ x 7.5″ x 5.5″ and Grass measures 6″ x 4″ x 7″. Serra Ladies’ Novelty Pajama Set, $9.99. Choose Blue Coffee Jogger Set, Purple Wine Jogger Set, or Black/Red Amazing Bootcut Set. Sizes S–XL. Serra Ladies’ 2-Pair Ultra Soft Socks, $3.99. Fits Ladies’ shoe sizes 4–10. Assorted colors. Ambiano 5.8-Quart Programmable Slow Cooker, $24.99. Also available: Boulder Slow Cooker Liners for $1.49. Crofton Pizza Pan Assortment, $3.99. Choose a 16″ Pizza Pan or 12″ Deep Dish Pizza Pan. Boulder Football Tableware, $1.79 for 20- to 40-count. Crofton Football Silicone Bakeware, $2.99. Assorted varieties. Crofton Kitchen Tools, $3.99 each. Crofton Self-Standing Kitchen Utensils, $2.99 each. Choose XL Turner, Solid Spoon, Whisk, or Skimmer. Easy Home Mesh Kitchen Cabinet Organizers, $5.99. Assorted varieties. Crofton 16-Piece Durable Food Storage Set, $4.99. Features matching color-coded base and lids and 26.9-cup capacity. Easy Home Mesh Drawer Organizers, $5.99. Assorted varieties. Easy Home LED Connectable Strip Lights, $9.99. Switch to select from warm or cool light. Measures 1′ 10″ long, 2″ deep. Crofton Fridge Tray Assortment, $4.99. Welby Premium Brace Assortment, $8.99. Choose a Back Brace, Wrist Stabilizer, or Hinged Knee Brace. Welby Bathtub Safety Grab Bar or Raised Toilet Seat, $19.99. Welby Step Stool with Handle or Stand Assist, $19.99. Welby Reacher, $7.99. Folds in half for easy storage. Welby Bed Assist Rail or Multifunctional Adjustable Table, $14.99. Tyson Fresh USDA Choice Beef Pot Roast Kit, $8.99 for 2.75 lbs. Never Any! Fresh Antibiotic-Free Fajita Chicken Strips, $3.99 per lb. Natural Choice Fresh Pork Tenderloin Sliced Medallions, $2.49 per lb. Ambiano, Crofton, Easy Home, Huntington Home, Never Any!, Serra, Tyson, Welby. Bookmark. I went to your No Smithfield. RI store last week the day I got your flyer in the mail and I wanted to buy 2 Welby stand assists (maybe even 3) but they were not yet in your store. My husband has been ill and I have not been able to go back to your store. I want to go today if they are still available. I can’t find a tel. No. Please let me know if I can purchase these today. Thank you. I have purchased many items from you and I like your products.